For the first time in history, the KIMEP Alumni Association organized alumni reunion in Atyrau. Renaissance Hotel Atyrau Ballroom was chosen as a venue for this event. 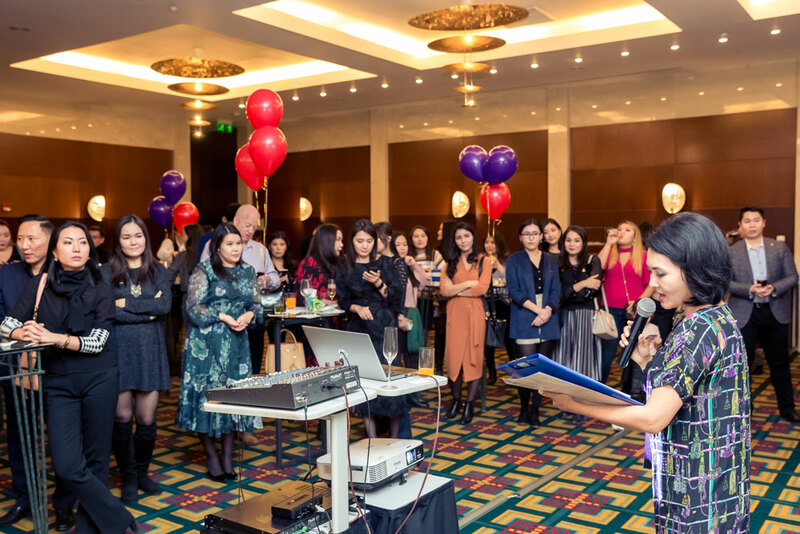 70 alumni of various years of graduation and programs living and working in Atyrau gathered for the reception. KIMEP University was represented by Raushan Kanayeva, Director, Corporate Development Department, Dinara Sagindykova, Alumni Specialist and Zhanna Bolotova, External Manager of ExMBA program. The official opening presentation by KIMEP representatives was followed by moving speech of KIMEP alum and Fircroft manager Arman Khamitbekov (MBA 2007) : “I am glad to welcome everyone to the evening dedicated to KIMEP Atyrau Alumni Chapter. In general, this is an excellent platform that we can use to develop the KIMEP alumni community in Atyrau, and to help new KIMEP graduates in finding jobs in companies in Atyrau”. The main sponsor of the event was Fircroft Kazakhstan: top management of this company consists of KIMEP alumni. These young people achieved certain professional heights at their age and they owe their success stories to KIMEP University. November 10, 2018 can be fairly considered as the date of foundation of KIMEP Atyrau Alumni Chapter. This is an important step to help Atyrau alumni become engaged with an amazingly active network of leaders in fields of business, government, non-profit organizations, media and academia. KIMEP will follow up on next events and forthcoming activities of Atyrau Alumni Chapter. Alumni who were interested in continuing their education got consultations from Zhanna Bolotova, External Manager of ExMBA program. During the evening alumni took photos, shared their stories and future plans. They participated in the Trivia game: they answered questions on interesting facts about KIMEP. The game went very actively, alumni were really happy to win prizes -KIMEP branded caps and mugs. The event demonstrated that Alumni Reunions are important both for graduates and KIMEP University. Alumni from Atyrau of various classes, different ages, working in different fields got together that evening for networking, for recollecting student life, for strengthening the feeling that we are one big family.